Avalon Hotel & Conference Center (Formerly: Hotel Avalon Erie), Erie, United States of America - Lowest Rate Guaranteed! 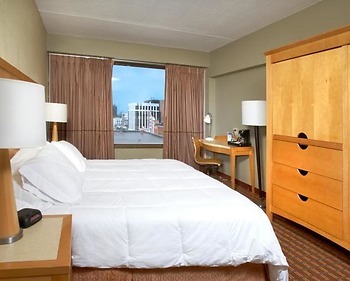 With a stay at Avalon Hotel & Conference Center, you'll be centrally located in Erie, within a 15-minute drive of Bayfront Convention Center and Waldameer Water World. This hotel is 4.4 mi (7.1 km) from Millcreek Mall and 5.4 mi (8.8 km) from Presque Isle Downs and Casino. The location is superb ! the double bed room i had was in very decent shape! The room almost looked to be remodeled already . The only part unfortunately is when the hotel changes names after the first of the year, the prices will be near doubling ! No good . Even though being remodeled . I believe the current price is plenty ample enough money for a hotel room for a 20 hour stay. The new owners have plenty enough money to not have to be so greedy . The continental breakfast was nice. Everyone very helpful. Close to Warner Theatre. Unfortunately, both nights were very noisy on our end of the 5th floor. Poor for sleeping and annoying. The whole check in and check out was quick and easy....very respectful of privacy. Clean room a great place to stay!